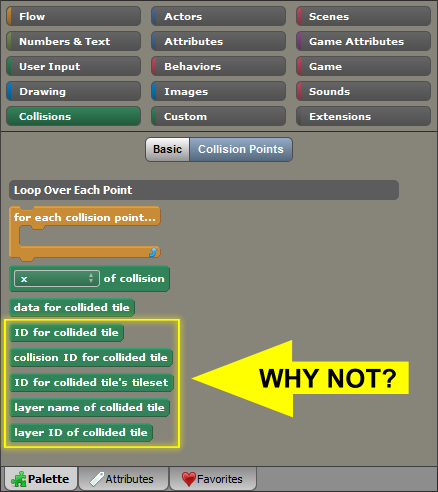 Issue Tracker - Issue #749: Convenient blocks to get relevant information about the collided tile. Convenient blocks to get relevant information about the collided tile. Issue: Convenient blocks to get relevant information about the collided tile. Currently, we can get only the Data of the collided tile, and this is very limited. Really need these blocks as well! The problem is that actors don't actually collide with the tiles per se, but instead they collide with a collision shape that Stencyl creates for you at the border of collide-able tiles. As a result, the game doesn't know what tile you collided with - only that you collided with a shape that corresponds to the tilemap. @Donni11, I don't think so because if Stencyl is able to get the , this means that Stencyl knows what tile you collided with. I think that just gets the data from the collision shape. No, because when a lot of tiles together are sharing the same collision shape, Stencyl is still able to get the data of each tile. I never thought about that. Yeah so I guess Stencyl should have these blocks already. Hopefully they come soon. Added a new block in b10311 to get the column/row of the collided tile. The first tile found that has collision is used. If there are multiple tiles with collision in the same location then these blocks will not work as expected. Sounds like some of this information can be gathered from the Tile API. For example, one could detect which side was collided for the player, as in top, bottom, left, or right sides, then grab the nearest tile or tiles ID for that. Some rounding might be necessary with tilseizes and shape. I use this to change footstep sounds based on material when my player runs around. @Rimrook, we know that sometimes there are workarounds, but the suggestions are to ask for more direct and easy methods.